Positive and steady. 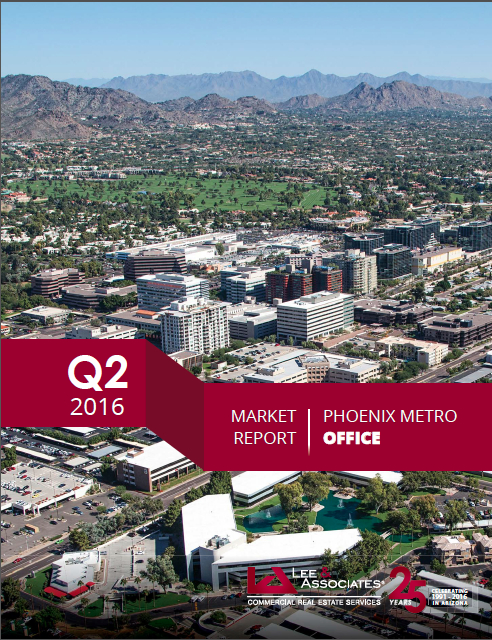 Those are the two words I would use to describe the office leasing market in Metro Phoenix as of mid-year 2016. The numbers in the below report also reflect this sentiment that I see every day on the streets of the market. Across the entire portfolio of buildings my team leases, we are seeing some of the best activity for this cycle. The tenants I represent feel more confident in their businesses these days and are either staying the same size, or often expanding their footprint. Additionally, Craig and I were fortunate to negotiate two of the five largest leases for the quarter. The office market continues to chip away at a vacancy that reached 27.1% in 2009, and now stands at 19% across all building classes. It posted another 820,000 SF of positive net absorption (job growth) in the second quarter to reach 1.45 million SF for mid-year. This means that we are approaching the equilibrium levels of 15-17% vacancy, where on a macro level, it’s neither a tenant’s or a landlord’s market. However, real estate remains very local, and depending on the part of town, vacancy and rental rates will vary substantially. 1) Class A vacancy sits at 17.7% today, the lowest of all the building classes – this supports the trend I’m seeing that businesses are paying up for top-grade real estate as a recruiting tool. 2) South Scottsdale and Tempe continue to boast the lowest vacancies (10%) of all the submarkets- Arizona State University, Downtown Scottsdale and the Mill Avenue Districts remain the epicenter for energy in all of Metro Phoenix. 3) Transaction Sizes look different - A few years ago, tenant activity seemed to consist mainly of gorillas (100,000 SF+) and minnows (<5,000 SF). Today, the majority of the transaction sizes are 50,000 SF or less. We are seeing less large-scale consolidations take place and more moderate growth among businesses. Between the 120-130 transactions my team does annually, we represent a great cross section of the market. To learn more about how market dynamics affect your building or your business, please call me. P.S.- We know you will get PUMPED up after watching this video. Click Here to see if dreams get deflated in this week’s video.